This year marks the 230th anniversary of John James Audubon’s birth and around the country events and exhibitions are commemorating the event. Here in New York Audubon enthusiasts have multiple opportunities—and ways—to observe the naturalist’s birthday from viewing his art to screening a new film about him to taking a walk through the Audubon Park Historic District or having a piece of cake at his birthday party. Part III of the splendid three-year showing of all of Audubon’s original paintings for the Birds of America—The Complete Flock—is ongoing at the New-York Historical Society on Central Park West and 77th Street. This last installment, on display through May 10, 2015, is entitled Audubon’s Aviary: The Final Flight. Before you go, read an interview with Dr. Roberta J. M. Olson, Curator of Drawings at the New-York Historical Society, as well as curator of The Complete Flock and author of Audubon’s Aviary. Her comments about Audubon, his art, and assembling this three-year exhibition are a superb introduction to seeing the paintings themselves. 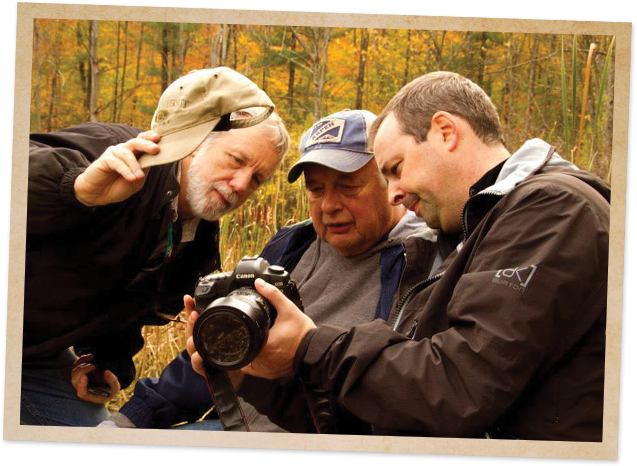 The New-York Historical Society will be screening Rara Avis: John James Audubon and the Birds of America, written and directed by award-winning American film director, screenwriter, and producer, Al Reinert, on Saturday, May 2, 2015 at 3:30 p.m. This special afternoon screening includes a Q&A with Al Reinert and is free with Museum admission. Film running time: 90 minutes. Q and A to follow: 30 minutes. Al Reinert is the two-time Academy Award-nominated writer and director of Rara Avis. He co-wrote the screenplay for the Ron Howard film Apollo 13 and he directed and produced For All Mankind, an award-winning documentary about NASA’s Apollo program. For more information about the film, including a trailer, visit the website: AudubontheFilm. The two guided walks through the Audubon Park Historic District on Sunday, April 26 are fully subscribed, but you can join a walk on May 1 or May 2. These will be part of the national Jane’s Walks, sponsored in New York City by the Municipal Arts Society. See here for more details. The distinctive footprint that disrupts Manhattan’s grid west of Broadway between 155th and 158th Streets—the Audubon Park Historic District—did not come about by accident or from the demands of local topography. 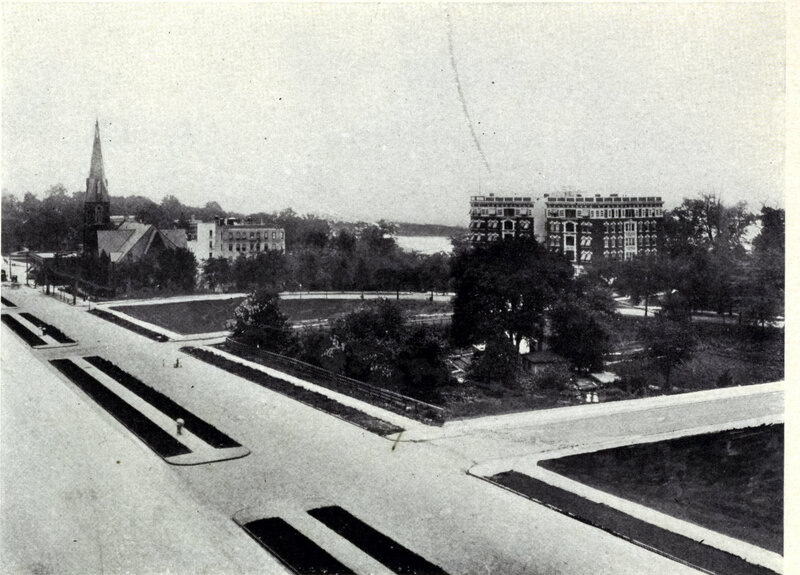 It unfolded from careful planning and alliances among like-minded property owners, whose social and political connections ensured that when progress swept up Manhattan’s west side, they would benefit. Take a leisurely walk through the architecture gems in today’s Audubon Park Historic district and learn about the family who controlled the rapid evolution from suburb to city at the turn of the twentieth century. 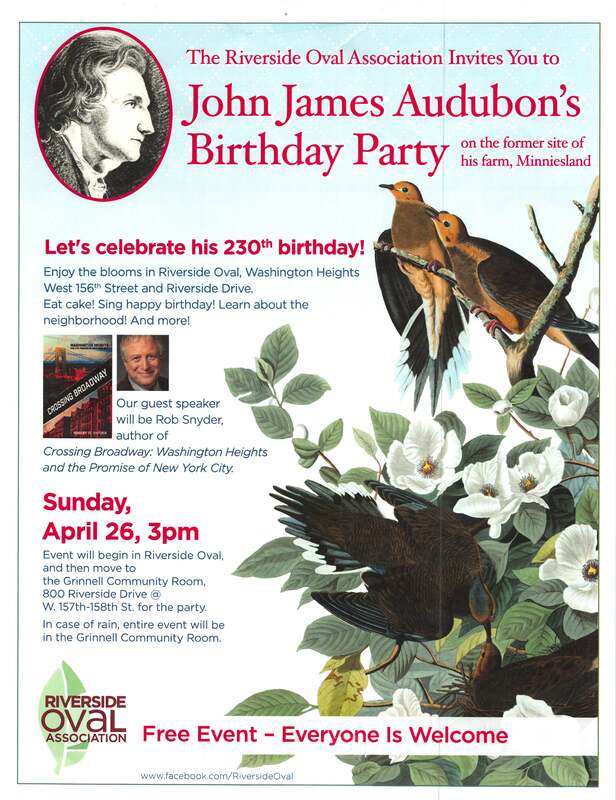 The Riverside Oval Association’s annual Audubon birthday party will take place Sunday, April 26, from 3:00 to 5:00 p.m. The party begins in the Riverside Oval Park at 156th Street and then continues in the Grinnell Community Room (800 Riverside Drive at 158th Street). In the event of rain, the party will begin at the Grinnell. This year’s guest speaker will be Rob Snyder, author of Crossing Broadway: Washington Heights and the Promise of New York City. Word Up bookstore will be on hand with copies of Crossing Broadway as well as several Audubon-related books. The Audubon Mural Project, a collaboration between the National Audubon Society and Gitler &_____ Gallery in the Hamilton Heights neighborhood of Harlem, on Broadway between 149th and 150th streets, is “an audacious and unconventional scheme for spreading the word about the plight of birds.” Many of the public murals are appear on the rolling steel security grates that protect business facades after closing time. Check the Mural Project’s website for a listing of current locations. 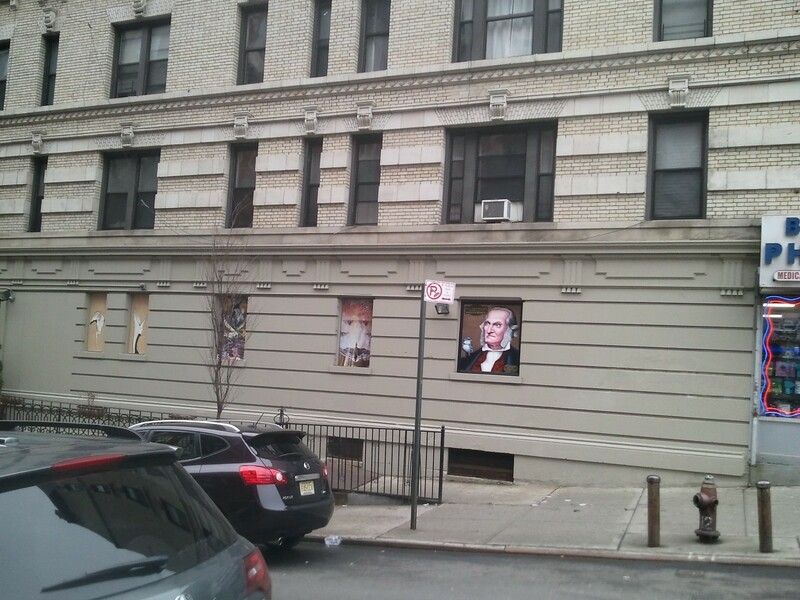 Some of the birds—as well as a portrait of JJA—are always visible on 149th Street west of Broadway, while others in the vicinity are only visible when the security gates are down, either in the evening or on Sundays. 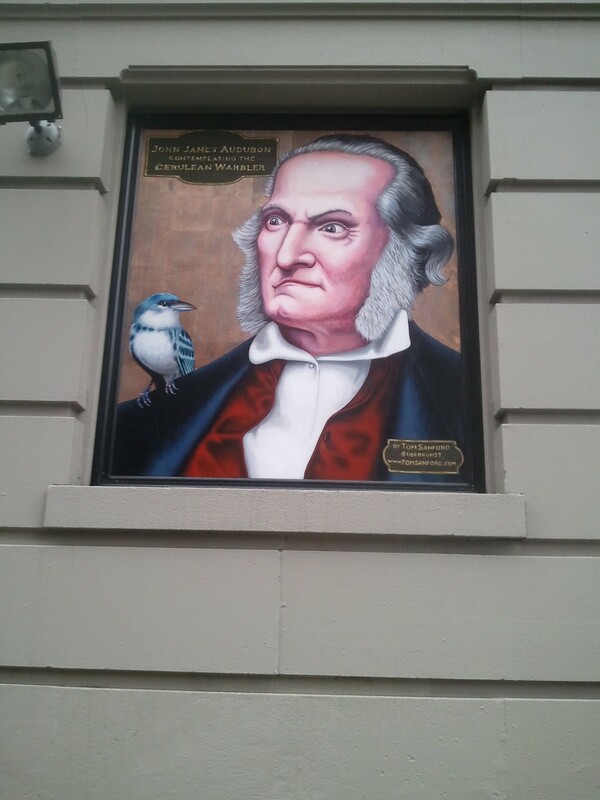 Posted in 230th Birthday, Audubon Park Historic District, John James Audubon, New-York Historical Society, Rara Avis. Bookmark the permalink.